Bridging units can span up to 4.2m. This links tower scaffolds to provide a continuous walkway bridging over obstructions. 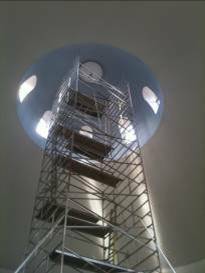 Ensure safety on your site by providing an access scaffolding aluminium stair tower. 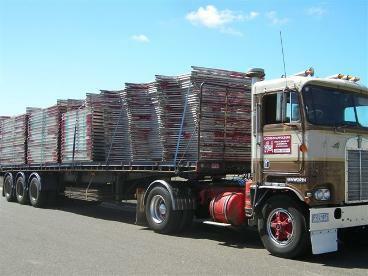 Quick to erect, easy to transport, cost effective. Aluminium modular scaffolding is ideal for cantilevered scaffolds being both rigid and light weight. U-heads may be used to secure the scaffold to the needle. 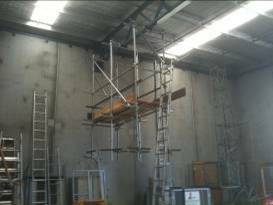 Independent runs are easily achieved with a continuous walkway being created using Access Scaffolding’s unique “walk thru frames”. These are wide enough to allow wheelbarrow access. 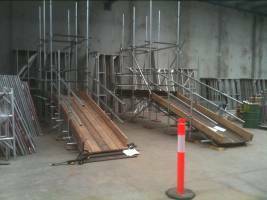 Combination frame, allspan and tube and coupler scaffolds for those awkward situations. Conventional mobiles to 10.2m high. 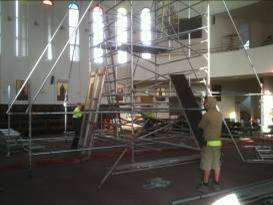 The only scaffold that complies with AS1576.2 Stability of Free Standing Scaffold” legally allowing 10.2 standing height reach 12.6m. Hanging scaffold under a bridge, 1.3, 2.0, 2.5 and 3.0m platforms allow for various bay lengths to fit between structures. Linked up bays to provide a large work area. Ladder access with trap doors on platforms provide safe access and egress. Two work levels provide complete access to the sign.